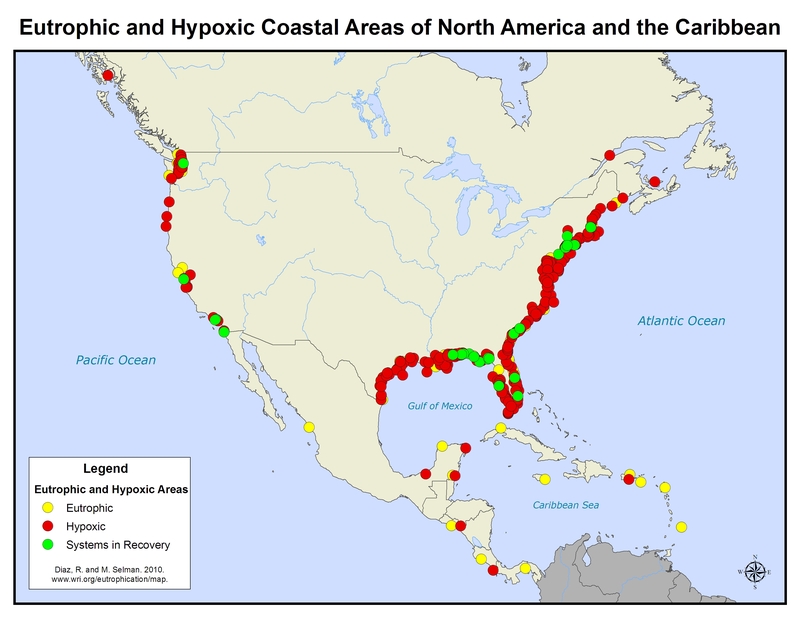 This map identifies 131 eutrophic and hypoxic coast zones in North America and the Caribbean. Sixty-two have documented hypoxia, 59 are areas of concern, and 10 are systems in recovery. Despite having many well-studied systems such as the Chesapeake Bay, which has 12 distinct eutrophic and hypoxic zones, water quality data in the U.S. still have room for improvement. In 2007 the U.S. National Oceanic and Atmospheric Agency’s (NOAA) National Estuarine Eutrophication Assessment program evaluated the eutrophic status of 141 estuaries, yet 30 percent lacked adequate data to make a definitive assessment. As with many less-developed regions of the world, data on eutrophication for the Caribbean is generally sparse, making this map likely an underrepresentation of the actual number of eutrophic and hypoxic areas.